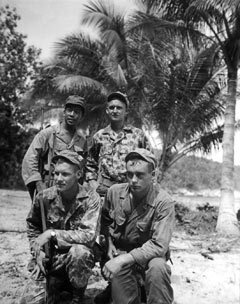 William E. Nellist (middle) pictured with unidentified trainees from the 4th Class. Cape Kassoe, Hollandia, DNG. August 1944. 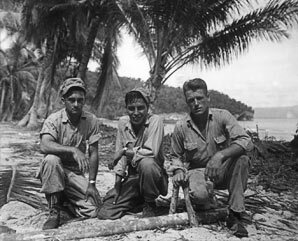 Joe Moon (left) and Denny M. Chapman (right) pose with an unidentified Scout at the ASTC at Hollandia in August 1944. 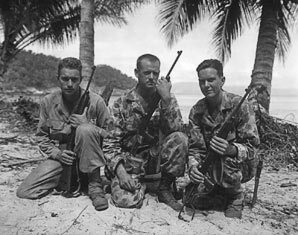 Moon and Chapman were graduates of the 2nd Class and were retained as operational Scouts. 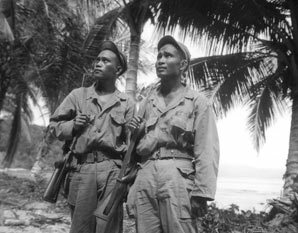 Thomas A. Siason (left) and 2Lt Honorato S. Eschavez. ASTC 4th Class. Cape Kassoe, Hollandia, Dutch New Guinea. 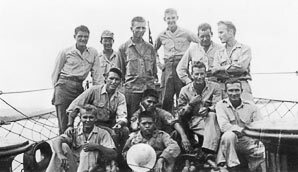 Galen C. Kittleson, front right. Thomas McClellan, back right. 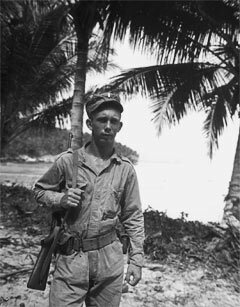 1LT Marion C. Meyers. 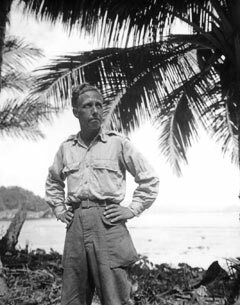 Meyers was an instructor at the ASTC and performed one mission with Ileto Team. 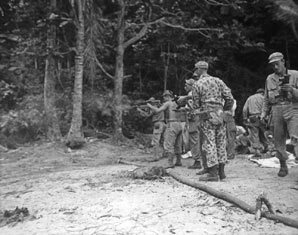 August 1944. Unidentified officer in training at the ASTC at Hollandia. August 1944. Trainees from the 4th Class practice at the small weapons range at the ASTC. August 1944. 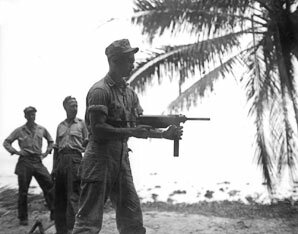 An Alamo Scout trainee fires a machine gun. 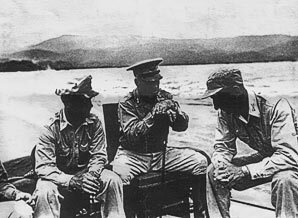 (L-R) Colonel James F. Collins, GSC, Chief of Staff, I Corps; MG Innis P. Swift, CG, I Corps; and 1LT Lewis B. Hochstrasser, Adjutant of the ASTC, aboard a J-boat on way to make presentation of Bronze Star Medals and to attend graduation ceremony of Alamo Scouts at the ASTC, Hollandia, DNG, on 22 June 1944. 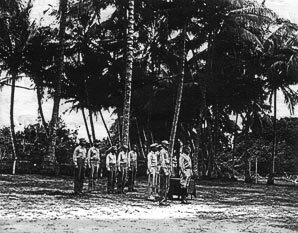 Major General Innis P. Swift and his staff at the graduation ceremony of the Alamo Scouts at the ASTC, Hollandia, DNG. 28 October 1944. 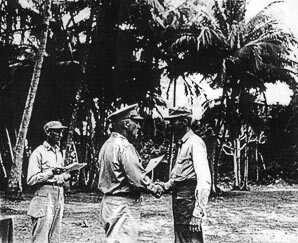 First Lieutenant William M. Ross receives a graduation diploma from MG Innis P. Swift, CG I Corps, upon his completion of the course at the Alamo Scouts Training Center, Hollandia, DNG, on 28 October 1944. Ross was a member of the 5th Training Class. 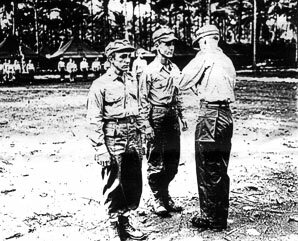 PFC Aubrey L. Hall, receives the Silver Star from Major Homer Williams at the ASTC, Finschaven, NG. 22 June 1944. 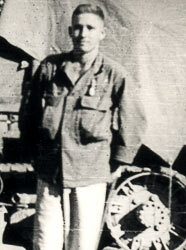 Jay Russell, 19 Feb 1945. 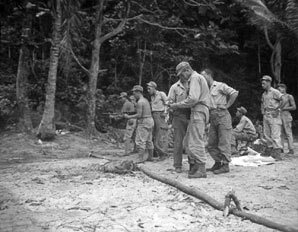 LUTZ & McGOWEN TEAMS following mission on Salebaboe Island, September 1944. 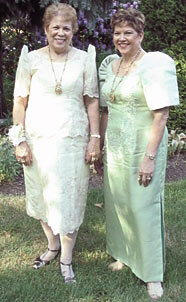 Eunice Carvajal (left) and her sister, Virginia Weatherill (right), in 2004. 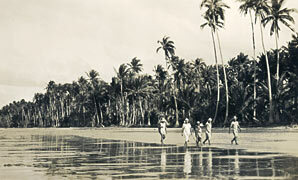 The sisters and their parents lived in Paracale on southern Luzon, and were frequent hosts to HOBBS Team during their long mission behind Japanese lines in the Camarines Norte area. 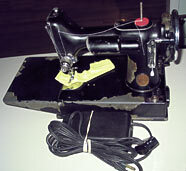 Singer Featherweight Sewing Machine used by the Carvajal family during the war. 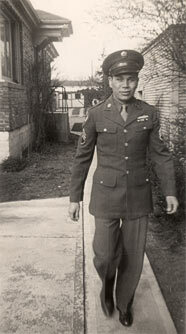 Following airdrops of equipment and supplies to his Alamo Scouts team by 6th Army, Lt. Woodrow Hobbs gave the parachute silk to local civilians. It was with this machine that Eunice’s mother sewed shirts for Hobbs and Lt. Ensor of the AIB who assisted HOBBS Team on the mission. 1945. Pulandaga Beach, Camarines Norte area, Luzon. 1945.